Five Generations of Winemaking Tradition in Altus. The Post Winery is a family operation dating back more than a century, still evolving and growing in the modern age. Mountain has brought forth crop after crop of grapes and muscadines. northwestern Arkansas. He settled in Altus, named for the Latin word for “high,” being the highest point on that rail line. 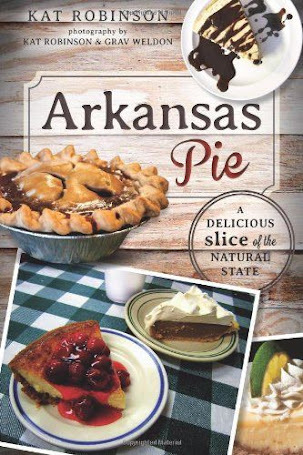 Post saw this land as a remarkable resource, semi-arid farmland that stayed frost-free late into fall and that soaked up the sun’s rays through the long Arkansas summers. Like other settlers, he married and was fruitful and multiplied. The vines he stubbornly set bore fruit and spread with careful tending and cultivation across mountaintop fields. 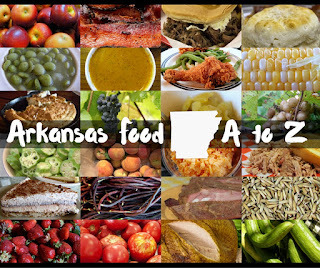 It wasn’t long before the Arkansas grape basket became known for its fantastic fruits and crops. Jacob’s children continued the tradition, and their children did as well. Other families also prospered with their wineries in the area. One source says that there were possibly 55 wineries in the region before Prohibition. But that act in 1918 stymied growth. Post changed over to the production of sacramental wines and survived the period. Others didn’t fare as well. Crazy rules were put into place during these times… including a requirement that all storage warehouses had to be secured with barred windows. The bars on the windows of an old warehouse on the Post Familie farm were put up because of a federal law that required alcoholic products to be kept under lock and key. Unfortunately, this sort of construction meant that in the case of fire, some people might not be able to make it out. The law was repealed several decades later. With the repeal of Prohibition, the wineries came back to life again. There were at one point 42 wineries operating. In 1938, some of Jacob’s grandchildren and other area growers bound together to form the Altus Cooperative Winery. In 1947, grandsons James and Matthew Post bought the winery and renamed it Post Wineries, Inc. The old family winery would become in 1956 another popular winery, Mount Bethel. Of course, time distilled the wineries down. Partnerships were made, wineries merged, and today there are five in the area -- Post, St. John’s, Mount Bethel, Chateau Aux Arc, and Wiederkehr. Each is linked by three things -- the region, the tradition of winemaking, and a kinship that is literally blood-deep. My traveling companion and I visited the Post Familie Vineyards and Wineries on a mild July Monday, and were greeted with grins and good greetings. Joseph told us about the family connections -- how all five of the wine operations are family. Though Audrey House up the road at Chateau Aux Arc started out on her own after purchasing vineyards from Wiederkehr in 1998 as an independent operator, she eventually became part of the family. not just because it was large but because there were bars on the windows. The name still draws a chuckle today. It’s still working in the community, too. Other wineries and independent growers have their crops bottled here, share in labeling endeavors, and more. Post doesn’t charge for its tastings. It offers a winery tour that ends in the gift shop -- where a special bar has been set up. Lots of people come through on the weekends -- but they’re usually accommodated. A second tasting area is just off the warehouse. the bottling process -- on that particular day watching muscadine being swiftly delivered into bottles and corked. The noise was incredible. Several guys were working the line, making sure everything stayed in line, keeping the machinery working, pulling the finished bottles off the end and carefully packing them into case boxes. We went from there out to the fields themselves. On the drive out, we talked about the difference between last year and this one. “We’ve had just unbelievable amounts of rain,” Joseph told us. In 2007, 90 percent of the grape crop and 40 percent of the muscadine crop were lost. grape globes gleaming in the early afternoon sun. Joseph pointed out that this year’s rains have really helped with irrigation, but the crops are a little late. “We usually start harvesting the last week of July or the first week of August. This year I think we may be about a week behind. We harvest through the month of September, and we’re generally finished by the second week of October. It’s about a two and a half month harvest. We stopped to take a look at one of the sections. Under the hand-span leaves bunches huddled in crowds, mostly a light green. A few of these had already started to turn, big purple splotches on a few and then the surprise of dark purple grapes here and there. They grow mostly in shade -- the leaves form a thick canopy that lets through just the right amount of light. There’s testing done in the field before each type of grape is harvested -- a taste test to make sure the grapes are good and ready to go. Vines are pruned back periodically so the majority of soil nutrients travel to the grapes. Joseph says that if the frost doesn’t get them, some of the vines can actually start up a second crop. It takes three to four years for a plant to produce. In the first two years, the seedlings are grown in nursery lots. Then they’re moved to their own lines in the vineyard. They’re trained to grow upwards in a “T” formation by hand -- just like you train tomatoes. But unlike tomatoes, these vines continue to grow upwards and outwards throughout their life. They grow along a series of wires and poles set out by hand. Many of these varieties are still hand-picked; others are now mechanically harvested. In one section of the vineyard, dozens of new varieties and hybrids are growing. These experimental varieties usually don’t bear out great wine -- but over the years, some 15-20 of the new grapes have proven successful. In fact, some of these grapes managed to survive last year’s freeze. By committing themselves to experimentation and research, the Post Familie may come up with the grape variety that will be the signature wine grape of the 21st century. We were headed back out of that patch when Joseph spotted his dad. 83-year old Matt Post is the patriarch. The grandson of Jacob, Matt’s raised his children on this land, and many of them and the grandchildren still work for Post. We met Matt Post, at 83 the patriarch of the Post Familie clan. He was out hand-training vines that were planted in April of this year. In training them, Matt takes a long vine on each side of the stalk and ‘trains” it up to the guidewires up top with a bit of string. He then removes the other shoots from the side of the main stalk. He takes and manipulates the vines so that they reach up in a criss-cross fashion. This gives extra support to the vine as it grows -- enabling it to bear the weight of all those grapes. The grapes Matt was working on are Noble grapes -- when they mature, they turn almost black-purple. They’ve been growing Nobles since 1970 -- when they got this variety from the University of Arkansas. Joseph drove us back to the winery complex to show us some other neat stuff. Out front of one of the administrative buildings, there are a couple of grape presses that have been preserved for generations. One of these is a genuine Rolex -- seriously, that’s the brand. The other is a former printing press for the Fort Smith Southwest Times Record -- that was expanded for use on grapes. The first stop on the tour for most visitors is the vat room. What most people see is a display area that contains a couple of vats and examples of processing machinery. We went further back into the refreshingly cool building to view the gigantic cylinders of processing wine. This isn’t your processing system of old. Instead of the heavy oak casks of a century ago, wines now age at near-freezing temperatures, carefully monitored to prevent spoilage or contamination. Each one is monitored and labeled with what sort of wine is being produced, the alcohol and sometimes sugar content, the dates processed. We were allowed a rare favor -- a chance to taste wines straight from the vat. My traveling companion voiced his preference for the deep Cabernet Sauvignon, while I shared my appreciation of the Merlot. We went back into the bottling area. I asked about the recycling efforts… and found that Post has been recycling since long before it was popular. Used to be, people would bring their empties back to the winery itself. Regulations being what they are today, Post now recommends recycling through neighborhood programs. The bottles, the cardboard for the boxes, the plastic -- it all contains recycled content. Inside the building, just past the bottling room, there’s a tasting bar with a painting above it. One of the fifth generation Posts painted this tableau of the five brothers working together. 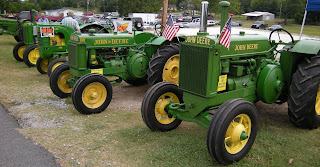 The family’s roots are deep here, and the tradition will continue for ages to come. For those who make the journey, the winery is a must-see. There’s also the free tasting at the end of the tour, complete with descriptions of all the available wines and a chance to purchase some to take home. Post wines aren’t all that expensive -- and the quality is pretty darn good. For those who want a little extra, a large gift shop is there to satisfy the shopping bug. 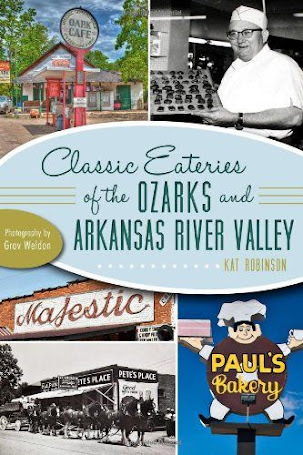 You’ll find the Post Familie Winery along St. Mary’s Road (Highway 186) in Altus. 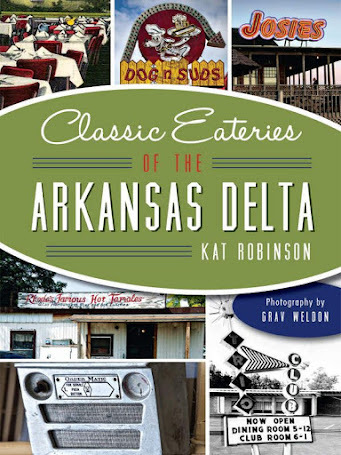 To get there, take Interstate 40 to exit 41 and head south six miles. The winery is on the left, about a block before you get to U.S. 64. The winery is open Monday-Saturday from 9:30 a.m. to 6 p.m. and Sunday from noon to five. Tours are offered most days on an as you arrive basis between 11 a.m. and 3 p.m. Of course, it’s busier during the different festivals throughout the year, so plan accordingly. You can also visit the Post Familie website, or give them a call at (800) 275-8423. A perfect little break in the summertime heat... made better by a taste of heaven. 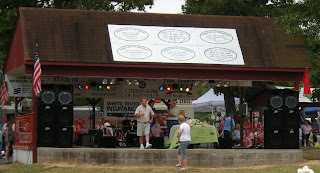 That's my impression of this year's Cave City Watermelon Festival. After a couple of weeks of temperatures dawdling around the 100s, the weather broke Thursday night and evened out into a relatively cool (for August) mid-80s range. Before the weather break, I'd actually toyed with the idea of skipping this year's festival -- there are just some things you can't quite handle in this condition. I was thankful to feel the change in the air -- and Saturday morning I pointed my car towards north central Arkansas. There were plenty of others heading that way, too. I stopped for gas and overheard a family talking about their plans for the day, and grinned. It was nice. 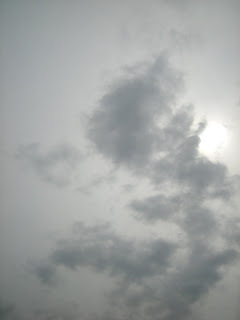 The sun was taking its sweet time in between peeks from the cloud cover, but no one seemed to be complaining. I drove up and found a spot not too far from all the activities, under a broad tree that provided some necessary shade. 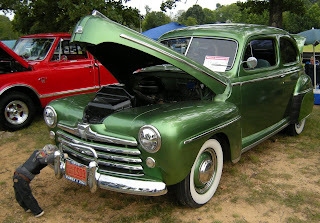 some shows, this one isn't just about cars classified as antiques. 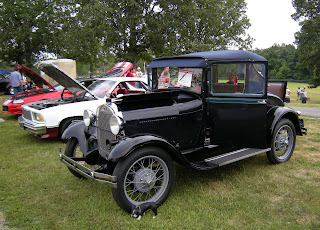 High school students proudly share their achievements in fixing up the family car, or a stereo system, and these more modern cars share a field with rows of classic Model As and GTOs and the like. 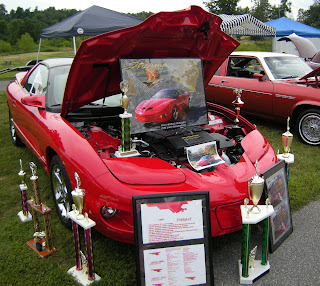 Some show off trophies, while others spice up their entries with novelty music or car seat covers. 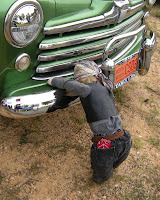 There are even some that feature figurines -- like a Boston terrier pup sniffing the wheels, or a tiny mechanic peering through a grill. The colors at the show are bright, the music is everywhere... but nothing too loud to share a conversation over. 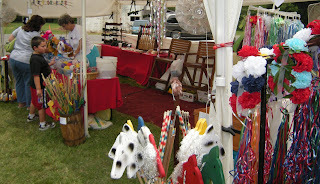 Owners related their expertise to each other and to those passing through the rows... one even offered a cool drink. Lookee-lous captured shots on film and digital camera, and children flitted back and forth, gawking. I made my way towards the center of the park, where the festivities were already underway. I could hear a harmonica wailing in the distance. Children clambered over the playground, and parents watched from a distance, chattering among themselves while focusing on the equipment and their young charges. 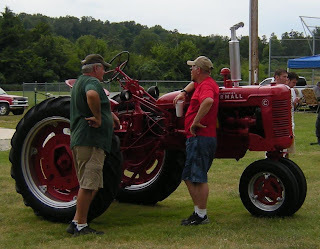 Older gentlemen were sharing stories over the tractor display -- some tractors out-aging even the octogenarians in the crowd. The wind kicked up a little, and there was an almost felt sigh from attendees who welcomed the movement. 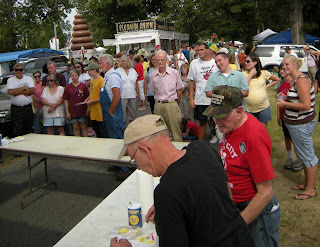 The first stop inside the main portion of the festival was at the festival pavilion, where everyone was handed a Dollar General bag that contained a couple of pens and a Mardi Gras beaded necklace with a big Cave City Watermelon Festival medallion. There was also a program, sharing what was coming up in the afternoon. 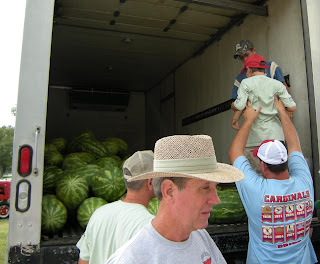 The sacks, I came to find later, was for those watermelon rinds... a good idea, for sure. The crowd was starting to thin out a bit, as many of the festival-goers took off for lunch. Some were headed on foot down to Sonic, a few blocks away and a major sponsor for the event. The drive-in was featuring watermelon slushees... what else would they offer? 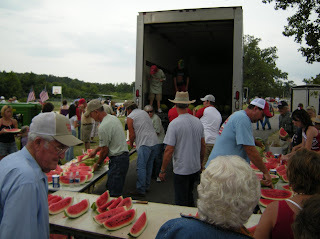 Others were headed back to their cars to grab a bite of lunch from coolers and picnic baskets. I decided it was a good time to take a brief leave and head out on a mission. After all, could I really leave Cave City without some of this year's bumper crop? I noticed as I passed that the lot for Hometown Grocery was full -- and there were a couple of guys carrying out ice. Gotta have the right supplies. I pulled back out on Highway 167 and headed north. First stop was the Perkey place, but strangely enough there were no watermelons today -- just a self-service stand selling tomatoes, squash, and peppers. I put my money in the jar and left with a pint of almost too-red tomatoes, plump and fragrant. These will no doubt be part of my lunch these next few days. I went on up to the Johnson Brother's place. Every year I get one of their sweet reds, and this year was no exception. This year was a little different. Sure, I've craved my share of watermelon, but for the most part I've abstained -- since grocery store watermelon just can't compare. 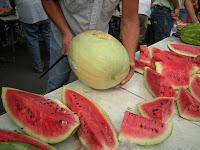 So it was that the first sweet bite of watermelon I consumed this summer came at the end of a farmer's pocket knife -- because as always there was one big melon already opened and sliced for sampling. One of the guys helped me with the two $5 melons I picked out and put them in my trunk, already lined with towels to keep them from rolling on the way home. Back down the highway then, to George and Brian Carter's stand on the main drag. It seemed like the whole clan might have been out -- there were easily a dozen people under the big pavilion. A couple of the teenage boys hauled more melons to my car to take home. 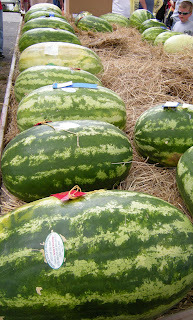 Unlike the dark green rind of the Johnson reds, these reds have a light green face with a few darker green stripes. The whole operation of heading down the road and making my three stops took me less than 40 minutes, and I was soon back parking in the shade again. The park was beginning to fill up. Some folks had come out and decided to eat on-site, which wasn't a bad choice. 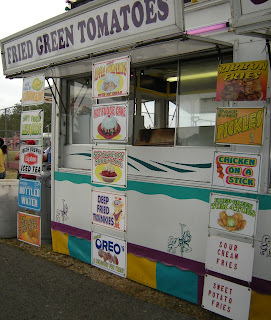 Several of the local churches were offering cheap eats -- like the $2.75 burger at the Free Will Baptist Church stand. Drinks were $1 for water and 75 cents for soda. 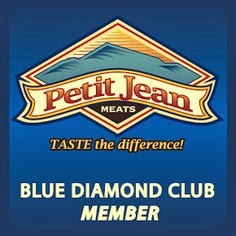 presumably also deep-fried. Another offered the almost impossible to conceive of combination of Reuben sandwiches and frog legs. 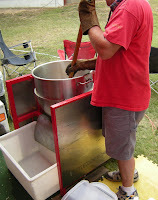 There was also an Ozark Kettle Corn vendor and the inflatable ice cream stand. 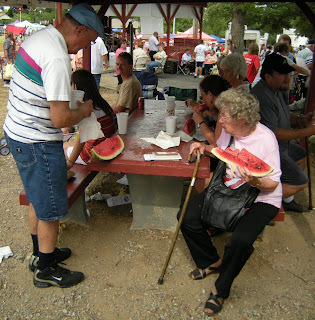 A steady stream of visitors passed by the wagon bearing the winners of the watermelon contests. 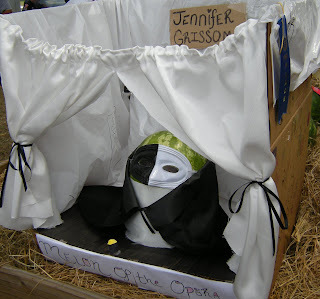 This year there was an unusual entry on the end -- a stage-decorated box bearing the "Melon of the Opera," a masked entry into the competition. 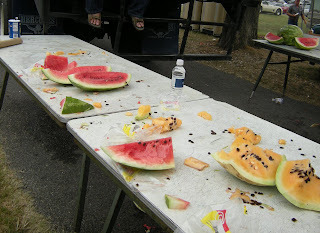 It took the end, but didn't conceal the other entries -- big, healthy, shiny melons of varying colors. The names here were familiar -- Penn, Patterson, Wooldridge, Perkey. 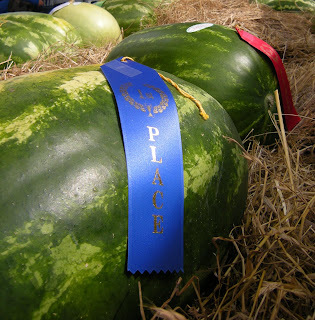 There are six families that continue the watermelon growing tradition around here, and it's always a tight battle to see who can bring home the ribbons in any given year. 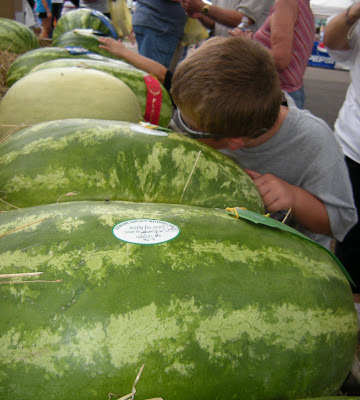 One of the younger festival-goers seemed to take special interest in the melons. He'd go up to each one, put his ear to it, and thump it with his fist, tuning his ear to decide for himself how good these melons were. business people in the area -- there were just a few that seemed to be on the festival circuit. 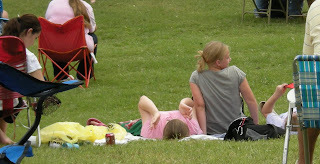 Teenagers were bearing what is apparently the fair fashion this year -- brightly colored hair sprays. Whatever happened to face painting? 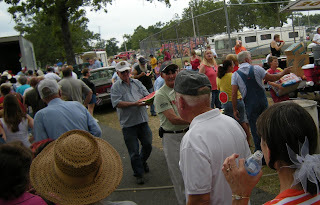 Up towards the gate at the northeast corner, members of the Cruisadors were handing out water to the thirsty for free. 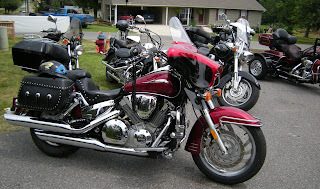 The Christian-Riders-United-In-Spirit-And-Determined-On-Rescuing-Souls Cruisadors is a chapter of ABBA, the Arkansas Baptist Bikers Association. 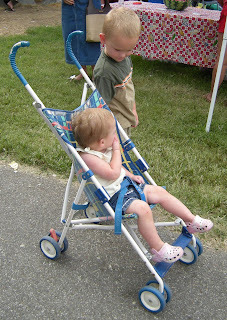 Several kids of all ages were checking out the sweet rides and asking questions. 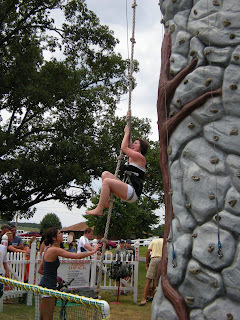 Not far away, a young woman was trying her hand at climbing a rope at the rock wall booth. She was giggling so hard I thought she might fall. A young man tried the wall next, but was less successful in his attempt. 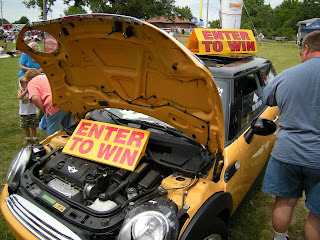 A little further down, a crowd had formed to enter a drawing for a small yellow car. Each person would write their information on a little slip of paper and press it through the window into the car itself. I suppose that's easier than keeping up with a bunch of entry boxes! The crowd was growing under the trees, as families brought out their chairs and set up for the day. I took the opportunity to go grab mine from the car, as the Gaylon Sandefur Band broke into their popular song, "Chicken Truck on Highway 25." That one drew quite a few chuckles. There aren't really any bad seats out on the lawn -- the park was set out well, with the bandstand placed on the edge of the natural bowl. The audio guy was doing his job well -- everyone could hear well without anyone really being blasted out. I set up my chair and pulled out my water bottle and notepad. The youngest member of the Sandefur group, Roger Gardner, broke into a rendition of Bob Segar's "Old Time Rock & Roll" and a few of the kids in the crowd danced on blankets thrown out on the ground. I caught a glimpse of one of the locals in a festival t-shirt and giggled. This year's theme was "Dripping with Sweetness." Indeed. 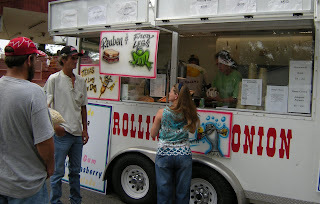 The wind was lolling through the crowd, bringing with it the ruffle of the air sock from the Sno-Cone concession, the scent of syrup and funnell cakes and fried onions, and the dull roar of a hundred different conversations. 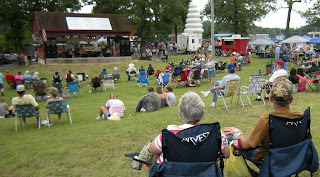 The atmosphere at the festival was rather laid back. 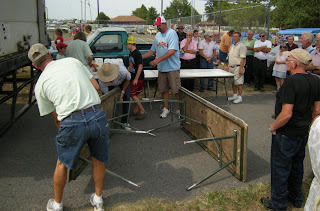 People would come out, set up their chairs and coolers, and then walk off -- completely unconcerned about whether someone might come along and disturb their possessions. It's a relaxed attitude you don't see at the larger carnivals. 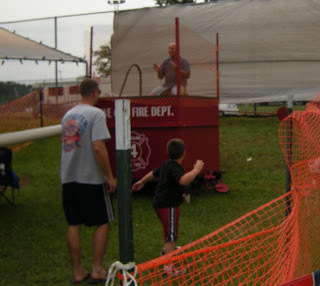 There's a sense of trust that's assumed and sacred at these small-town festivals, and I am thankful for it. had brought tiny dogs. The crowd, for the most part, talked rather than hollered, and many were just kicking back with closed eyes and listening to the music. As the band kicked into "I Just Took A Trip To Heaven" the scent of barbeque wafted up from the concessions. 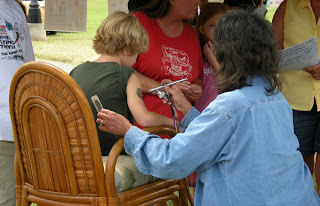 Kids were playing in the grass, and one young boy was challenging all comers with his bank-provided fan. There was a pause in the music, as James Mack Street took the stage for the quilt raffle. As the quilt was brought out for display, the audio guy played a pre-recorded announcement, thanking the sponsors for the event. 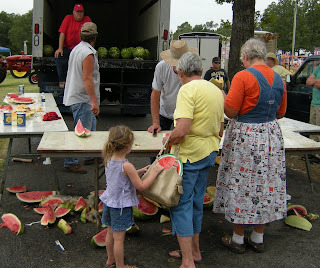 And they do deserve that thanks -- unlike many other festivals, the Cave City Watermelon Festival is entirely free. The parking is free, the car show is free, the concerts and the contests and everything else -- everything, that is, except the vendor's wares -- but that's to be expected, these people have to make a living, after all. Even the watermelon is free. guarded my raffle ticket, but alas it wasn't my day... a lady from Cabot took the prize. One of the guys by the stage immediately offered her $200 for it, but she just grinned and grabbed the big blanket. Good for her -- it was a mighty fine quilt. Before the band started playing again, Mr. Street mentioned that the announcements weren't usually his job. They usually fall to Charles Landers, who's under the weather. Mr. Street mentioned that Charles and his wife Anita were a major force behind the festival. There was a loud cheer from the crowd in appreciation. The band kicked back up again, and I shared brief conversations with a few of the folks who were sitting near me. There was a family there from California, who'd come back to Arkansas to see folks and heard about the festival. I overheard from others that there were people from Chattanooga and from Boston as well. The local couple next to me were just as appreciative of me coming up from Little Rock as those who drove or flew from further away. The band broke into "Paper Roses," and a few of the older gentlemen in the crowd sang along. Then the young drummer tackled "Wipeout" with amazing vigor. I decided to wander around and catch a little more of the action. And I noticed that the refrigerated truck had arrived. I wandered up and joined the small crowd of people who were trading comments with the guys and boys gathered at the back. They all knew what was coming. We heard a helicopter approach, and some feared the worse. It was an Air Evac Lifeteam copter, and some wondered if there'd been an injury. Later on we'd find out that they were just there for the watermelon. Four o'clock was approaching, and the growers who'd gathered at the back of the truck decided it was a good time to go ahead and open up. The crowd could feel the rush of cold air as the door was hauled open. With little further ado, tables were set up in a "U" shape and accoutrements like plastic forks and table salt were set out. The line was already forming, people anticipating the cool bounty that was about to be laid out for all to enjoy. But there was no real rush. People continued their conversations. Some parents carried babies and toddlers on their hips or shoulders. Stories were shared. 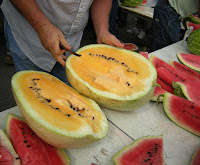 knives and took to splitting the melons up quickly and efficiently in all sorts of sizes. 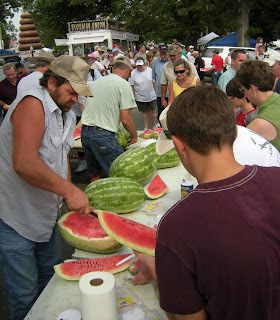 There was a stir to one side, where the first of the yellow melons had been popped open. Some folks have to have a piece of this rarer delight -- and there was a visual turn of the crowd in that general direction. 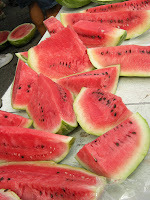 The sweet aroma of melon was pervasive, but not too strong -- after all, this is watermelon we're talking about. The line moved steadily and swiftly, as people came up and grabbed their slice and went back to sit down and consume theirs. 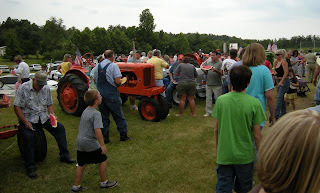 Some folks couldn't wait, and propped themselves up next to the nearby tractors to take in their share and be ready to come back for more. After all, it is all-you-can-eat. 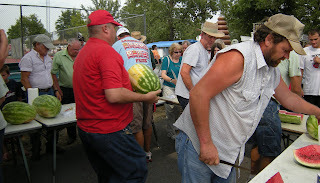 The gentleman popping melons nearest me looked up at me a couple of times as I snapped away at pictures. By this point he'd efficiently covered his section of table with slices, and the line was rolling fast. One of the other guys came up with a pale-rinded melon, gestured over at me, and grinned. The slicer got the message and popped open that yellow melon. I took a few more pictures and then gratefully took the crescent-shaped slice. There were people sitting at pavilion tables carefully exhuming seeds with spoons, and a whole family munching and spitting the seeds a bit further down the way. Me? I'm a flicker. I sat down in my chair, put my slice on my lap, and used my fork to flick away the seeds on the outside. One of my neighbors on the row passed down a paper towel. You can tell the veterans of the festival -- they bring wetted down washcloths in zip-top bags and paper bags for their laps. I didn't care if I got messy or not -- that's what the change of clothes in my car was for. The yellow melon was good and meaty -- not as sweet as the red, but more of a mouthful. There are afficianadoes out there who claim up and down that the yellow ones are better, and some who swear by reds. I like them both. 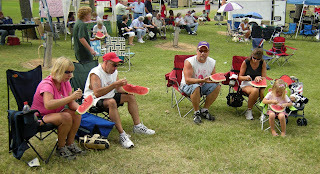 The band had even sat down to enjoy melon themselves. There was a strange calmness, a feeling of fraternity out there on the field -- with the quiet sounds of munching and slurping and whathaveyou. A couple behind me debated whether to go ahead and brave the line, which still reached back past the bandstand. Others didn't hesitate. was wrong in his prediction and the dry weather didn't hold. I had eaten my melon down to the rind, and couldn't resist going back for another slice. I slipped my fork behind my ear and tucked my napkin into the cupholder of my chair before getting back up. 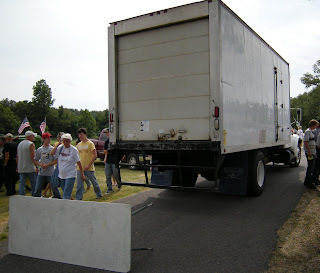 The back of the truck was already a third of the way full by the time I tossed in my contribution and headed back up to the line. much she owed. That elicited a friendly guffaw, and she and her husband were handed mighty slices. joined the line, but less than five minutes later I was back at the front, and I picked up another colossal slice before heading back to my seat. 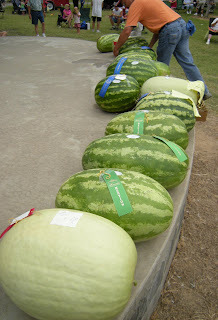 The prize winning melons had been carried over to the front of the stage for the auction, and as I sat the first of the melons went on the block. The first one was the People's Choice, voted on by anyone who wanted to vote and make any size donation to Arkansas Children's Hospital. This year's People's Choice winner was the Overall Youth Winner, a fine striped specimen from Carson Day and Cobb Gem, and it went for $250. 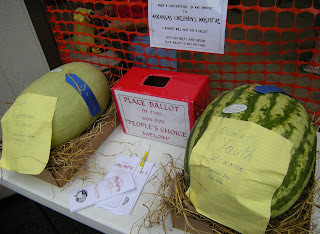 Other melons all burst the $100 mark, providing a fine pool of money for ACH. By this point, I was satisfied and rather saturated, too. The red melon had not only been sweeter, it had been juicier, and my shorts were soaked with melon juice. It didn't matter. The breeze joined the moisture to bathe me in Mother Nature's air conditioning, and I was feeling fine. On other days, I have stayed longer for the evening's entertainment -- but the clouds forming overhead and the two hour solo drive back home convinced me that perhaps I should be making my way back to the parking area. The Gospel Hour Singers were bringing up their equipment to take the stage early, and a couple of people in the crowd had brought out their umbrellas. It was time to go. 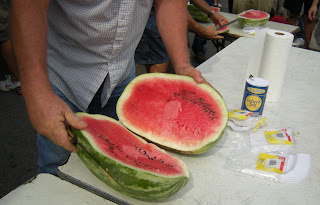 questions about how to grow melons, and how to make them sweet. I overheard the response -- "it ain't hard if you live up here." their stands along the way. 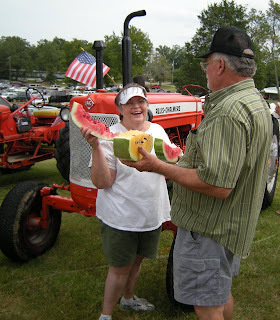 Pick yourself up a couple of melons -- take one home, take one to your friends to share. I've been enjoying these sweet secrets for more than 10 years, and I have yet to have one disappoint. But don't wait too long -- watermelon season doesn't last forever.